Ideologies are like engines: what matters is that they reach their destination, not what they run on or what they’re made of. But one vital difference is that an ideology can reach its destination without being internally consistent or conforming to reality. That isn’t true of real engines. Take the Mariner I space-probe in 1962. Its destination was Venus, but its mission failed completely because one small mathematical symbol was omitted from its on-board program. Now compare an ideology. The cost of failure in Iraq has amounted to trillions of dollars, but the ideology responsible — neo-conservatism — has not been discarded as dangerously useless. On the contrary, neo-conservatism still flourishes. That’s because it reached its destination long ago: it got into power, seizing strategic points of American politics, media and academia. For an ideology, conforming to reality can actually be a disadvantage. The palaeo-conservative Pat Buchanan has been right again and again about the errors of American domestic and foreign policy. To neo-conservatives and others who have been wrong again and again, this has merely confirmed Buchanan’s wickedness and cemented his exclusion from power. As I’ve pointed out before: in the Land of Lies, the wilfully blind are king. An ideology can run on lies and still reach its destination. Indeed, lies and fantasies can be a much more powerful fuel than truth and realism. The modern West has become a Pseudotopia, or Land of Lies, because false ideologies have defeated truthful ones. For example, governments across the West are no longer realistic about human differences. Instead, they deny these differences and insist that all human groups have equal potential. Why, then, do some groups fail to realize their potential? It can only be because they are prevented from realizing it. Racism, sexism and Islamophobia are at work, stifling potential, preventing equality. These hateful prejudices must be hunted down and stamped out. Like many anti-racists, Dr Zubaida Haque is not remarkable for intelligence or insight. But she’s an expert in the anti-racist algorithm that divides vice and virtue with scrupulous fairness between Whites and non-Whites. It’s a 50/50 split: all vice is assigned to Whites and all virtue to non-Whites. And we should note the Jewish background to her article. Her employer, the deceptively named Runnymede Trust, was founded by two Jewish anti-racists, Jim Rose and Tony Lester in 1968. The martyr-cult of Stephen Lawrence has been overseen by the Jewish anti-racist Dr Richard Stone. And the Rev. 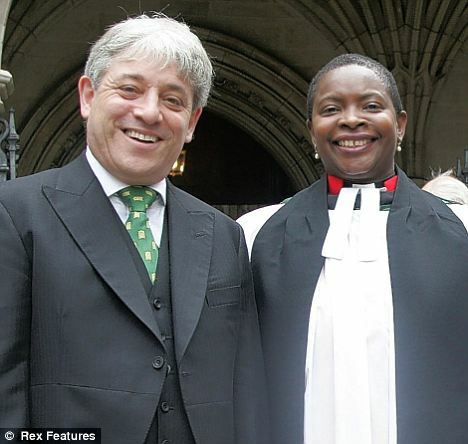 Rose Hudson-Wilkin, the Black female chaplain of the House of Commons, was appointed to “battle against racism and sexism” by John Bercow, the Jewish “Speaker,” or moderator, of the House of Commons (note that Bercow has recently been accused of bullying and other bad behaviour). This scenario, which follows directly from the fundamental axiom of anti-racism (see above), immediately deflates the self-righteousness of anti-racists. There is nothing unique or inevitable about oppression by Whites and the unjust suffering of non-Whites (as anti-racists see it). Things could just as easily have gone the other way — and in fact sometimes did, because large numbers of European Whites were enslaved by Muslims, who were often supplied by Jewish slave-traders. Blaming Whites so self-righteously and aggressively for slavery is rather like blaming a pair of dice for rolling 7 with 2 and 5 rather than with 1 and 6 or 3 and 4. Anti-racists claim that Whites have behaved with shocking injustice and cruelty down the centuries. But any other group of human beings would have done the same in the same circumstances. This must be the case by the fundamental axiom of anti-racism. All human groups are equal, therefore all human groups will use their free will to commit evil. However, although that is the logical inference from the fundamental axiom, in practice anti-racists effectively deny that non-Whites possess free will. Any apparent vice in non-Whites is actually the result of Whites exercising their free will to malevolent ends. Violent crime and failure by Blacks in America are “the legacy of slavery.” Violent crime and failure in South Africa are “the legacy of apartheid.” A recent article in the Guardian discussing knife-murders has said that London is like Chicago because in both cities a “working-class black population … has arguably been left to fend for itself and descended into violence.” Who has left the Blacks of Chicago and London to fend for themselves? Who is to blame for the ensuing violence? Whites, of course. But while the concept of free will is central to the blame-game of anti-racism, free will is never discussed in such articles, because that discussion would expose the contradictions of anti-racism. The ideology attributes free will, and therefore blame, to Whites, while denying free will, and therefore responsibility, to non-Whites. In other words, it implicitly asserts that Whites are weak and fallible humans while implying that non-Whites are somehow superhuman, with innate and impeccable virtue. If this implicit assertion is true, there can be only one solution to the problem of racism. Innately virtuous non-Whites must take control of innately corrupt Whites, who will never be able to stop using their free will to malevolent ends. Of course, this implicit anti-White reasoning is not meant to apply to Jews and their White allies in the leftist elite, who do not share in the original sin of ordinary Whites. Lord Glasman, a Jewish dissident in Tony Blair’s New Labour government, said in 2011 that the modern Labour party “viewed working-class voters as an obstacle to progress. [Labour’s] commitment to various civil rights, anti-racism, meant that often working-class voters … were seen as racist, resistant to change, homophobic and generally reactionary.” That is why the Labour government “was hostile to the English working class” and why it massively increased immigration. For the Labour party and other anti-racists, “progress” entails the subjugation, or even the extinction, of ordinary Whites. All of this is apparent in anti-racist behaviour and explains why anti-racists do not explicitly discuss metaphysical concepts like free will. An implicit belief in free will supplies the fuel for their self-righteous hostility to ordinary Whites, but explicit discussion of free will would expose their true aims. The ideology of anti-racism is not aimed at describing reality or creating equality, but at achieving power. Without their self-righteousness and aggression, anti-racists would not be so effective at instilling guilt in ordinary Whites, manipulating them to act against their own interests, and silencing them when they protest against their dispossession. But Diamond’s goyophobia is illogical by his own principles. There is no room for moralism or the unique culpability of Whites in the “All by Accident” school of history. If all human groups are equal in moral and intellectual potential, then no group can be superior or inferior, more virtuous or less evil. Consequently, human history must be explained by the chance factors of biogeography. And indeed, Diamond’s thesis or something like it follows with inexorable logic from the fundamental axiom of anti-racism. If race does not exist and we are all the same under the skin, differences between human groups must arise from external factors beyond human control and not susceptible to moral judgment. If the historical dice had rolled another way, then Blacks would have enslaved Whites and Jews would have committed genocide against Germans. Villains in our time-stream are victims in an alternate time-stream, and vice versa. There is no other logical conclusion. But anti-racists don’t reach that conclusion, because the ideology of anti-racism does not obey logic. Anti-racists follow their fundamental axiom only so far as it suits them. Although they claim that all human groups have equal potential, they blame the failure of non-Whites on Whites without any mention of chance or historical contingency. Rational anti-racism would be a much more sober and much less ambitious ideology than anti-racism as it presently exists. Rational anti-racism would not be strident or self-righteous, and it would not seek to bully, brow-beat or instil guilt in Whites. In short, it wouldn’t deliver what anti-racists really want: power, privilege and revenge. Editor’s note: I went to a talk by Diamond at a large packed lecture hall at Cal Tech in the early 2000s. When he gleefully fantasized about Africa conquering Europe, the crowd burst into applause. Being a reasonably respectable academic at the time, it was a good introduction to the anti-White hatred that boils just below the surface of the moralistic rhetoric of anti-racism.